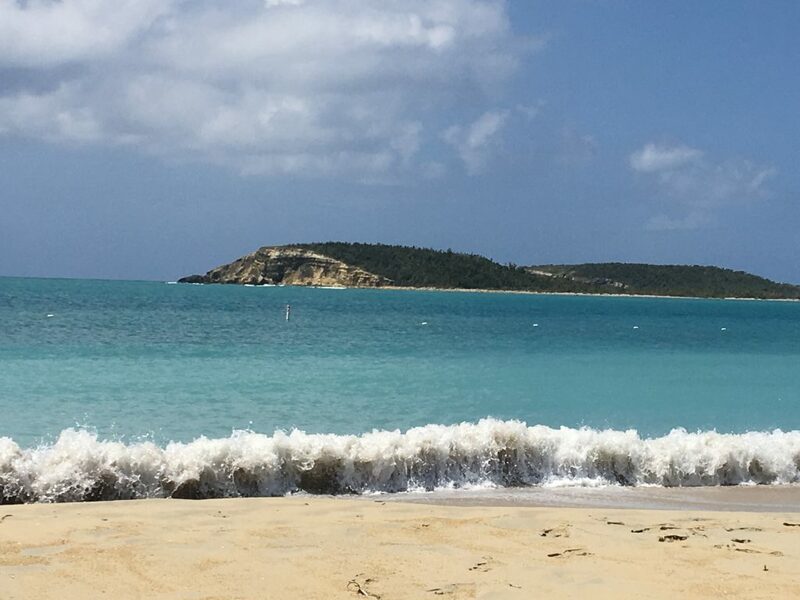 We’ve been in Vieques, Puerto Rico now for three full months so we figured it’s time to see how well it does with our island shopping list. We’ve always said that we wouldn’t choose a place to live long-term without having been there for at least a couple of months, so at three months that’s long enough to get a really good feel for the place. We’ll talk about the factors we care about when it comes to choosing a place to stay long-term, and there are quite a few of them. This post will be similar to the ones we did in the past on Utila, Honduras, and Roatán, Honduras, so you can look those up for comparison. 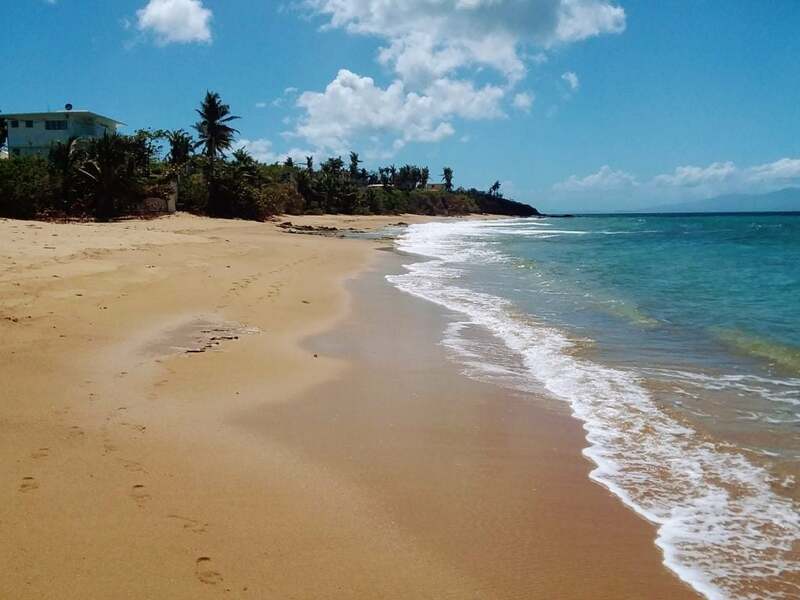 The big draw in Vieques is the beach, I should say the beaches, plural. There are dozens of them, with variety in the sand color and texture, the surrounding terrain, wave action, etc. Compared to the beaches of the Bay Islands of Honduras (where we were last fall & winter) this is a significant step up. No, it’s more than that, it’s really “one giant leap for mankind”, with apologies to Mr. Neil Armstrong. But Vieques is more than just beaches also, there are many strong attributes to this place, as we shall see when we go through the “shopping list” below. On the flip side are things like electrical power delivery, which is very unreliable. But as we’ve said before, you get the good with the bad, any place you go. 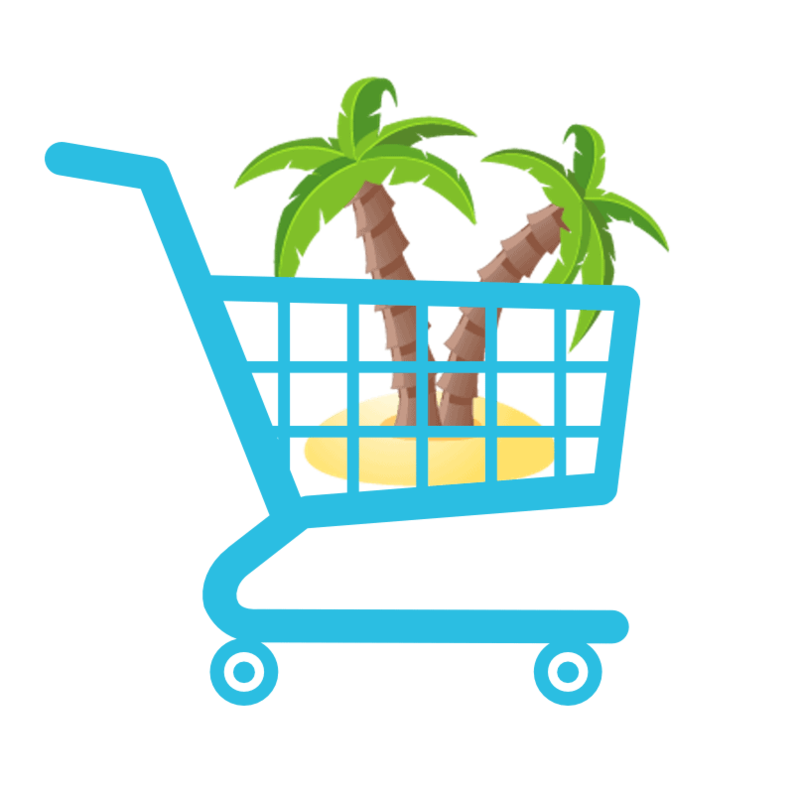 The turn of phrase that we are “island shopping” came from our friend Mamita in Utila, and we like it so we continue to use it. She found her island there, and although Utila wasn’t perfect for us we learned so much there we are truly thankful for the experience. But finding a place to settle and live long-term is a bit of a large “purchase” even when you’re only renting your house, so I put together the following list of important discussion points for Deb and I. As we’ve said, we didn’t want to boil it down to a raw number for each place but we did want to have points of comparison and discussion. The list is only very generally in priority order BTW. It flows from the needs to the wants, but some of them are pretty equal even though they are listed in order. So, without further adieu, let’s see how this rock measures up! Coffee, Tea, Beer, Rum, etc. Safety – this is a real positive. The neighborhood in which we live is called Florida (accent on the middle syllable) and is a very nice middle-class place. One neighbor works at the bank, another has his own car rental business, and a third runs the outdoor cafe/bar at the airport. It’s just a nice, normal neighborhood with mostly local people. We take normal precautions for safety and security but we have never felt any hint of worry. When we go to the beach and are in the water, we keep an eye on our stuff. If we are snorkeling, we’ll put the wallet and cellphone in a waterproof bag. We haven’t seen any beach theft but that possibility exists almost anywhere. In town, we lock our bikes as people have advised us to do, but we’ve done that everywhere we go. We don’t lock our car but it often locks itself (I need to figure out how to disconnect that!). As for emergencies, I’d say that last year the island wasn’t well prepared at all. The local government isn’t very effective from what I can tell (some statesiders will say that’s the understatement of the year). But after Maria, it’s my impression that the “plan for the worst, hope for the best” attitude is growing here. Utilities – The utilities are a mixed bag. Achieving the glorious trifecta of water, power, and Internet remains a challenge, but here when we lose electricity we don’t also lose water, so that’s a bonus. In fact, water has been consistent and consistently high quality compared to Honduras. The tap water is drinkable, even though we’ve heard people say they don’t drink it, it seems perfectly fine to us. Since we got our wireless Internet hooked up, communications have been pretty good, but not especially cheap at $78 a month. It has its off moments but we do plenty of web surfing, and are able to make audio and video calls over Wifi, as well as watch Netflix at night. We even FaceTime with our friends in Hawaii, rock to rock. This is a big step up from Utila and Roatán. Food & Drink – we’re pretty happy with the food and beverages here. Fresh vegetables are available from the street-side market twice a week, coming from North, South, and Central America. The quality is usually very good, except for stone fruits (peaches and nectarines) which have just been terrible. They look good, but they don’t ripen well. But we get really good broccoli, cauliflower, potatoes, tomatoes, carrots, onions, beans, melons, etc. Berries here tend to be expensive and often not too great. Of course, bananas and pineapples are excellent and cheap in this part of the world. Chicken is also very good, as is Puerto Rican sausages and pork. We don’t eat a lot of beef but it looks pretty good. The seafood we’ve had has been fantastic, we really love ourselves a Mahi sandwich on the waterfront! We can pretty much get all the spices we want if we look hard enough. There’s even a health food store in town for some unique items. The only bread flour we’ve found isn’t great, I’d like more gluten in it, but it’s good enough that we’re able to make some superb pizza on the grill with it. Prices for most foods are somewhat high compared to the States, but since we cook so much of our own food (don’t spend too much out), we can keep our total food budget in a reasonable range. I think I would say the food here is generally better than in Roatán, with a few exceptions. The coffee is good and cheap. The one we settled on (after trying many brands) is $3.30 for a 10 oz. bag of ground espresso beans. As for beer, there is only one place with draft beer on the entire island, similar to Roatán, but in general the beer scene is better here. It’s not Colorado, not even close, but I can regularly get Lagunitas, Sam Adams, and Sierra Nevada (a few beer styles from each of these breweries). There are some craft breweries on the mainland of PR, and I even found a Fat Tire in a bar here on Vieques one day. And now that I drank all the expired craft beer on Vieques, it’s all fresh now! 🙂 The Sam Adams I get for just under $10 a six pack, while the others are all in the $12-$13 range, and case pricing only helps a little. Of course, you’re not allowed to live here without drinking Medalla Light, the beer of PR. I actually like it, and it’s $21 a case, but there is a limit to it for me. Wine is good as well, and cheap because much of it comes from South America. We also have the Puerto Rican equivalent of Two Buck Chuck, but of course everything costs more so it’s four bucks. Our nickname for this surprisingly tasty Cab is El Cuatro. 🙂 But there are “better” wines too, that cost more for you wine snobs, ha! Bottom line, we’re happy and that’s what counts. Housing & Neighborhood – this is a real plus. The house we’re renting is fully furnished and stocked, which allowed us to come in and settle right from the beginning. It’s a 2 BR, 1 Bath with a cozy living room, dining room, and workable kitchen. The gas stove is a life-saver with our power situation. We recently ran out of gas in our 100lb tank and tried to call the local company to bring us propane. Their phone has apparently been out since the hurricane 7 months ago (as are all landlines) but they are just continuing on without it! So I hopped on my bike and went there (back to this again!). In Spanish, I asked her if she spoke English and she said “un poco” (a little). So in my best Spanish I said “OK, podemos tratar (we can try)”. And we worked it out, as she asked me what color my house was, who my neighbors were, you know, the normal way you find out where someone’s house is. 🙂 So that was all good and the new tank came later that day, perfect! I talked above about the neighborhood, it’s really great with kids playing out in the street, nice neighbors, everything you could ask for. If the next door neighbor would haul away the shell of a car in the street (it was destroyed by the hurricane and subsequently parted out), it would be even better. The yard is perfect for the dogs, they can go out and explore, ignoring the cats and chickens, but Kirby sure gets mad when the horses are in the neighbors’ back yards. He growls at them and actually chases them off! That’s one for the ages, a six pound dog scaring off a thousand pound animal! The proximity from here to town is excellent, it’s a good bike ride, and when you go to town for an errand you get a workout. Trash here is not the issue that it was in the Honduran Bay Islands. Horses get into trash cans at night sometimes (it was dogs in Honduras, every day) but most people fashion a lid for their cans to keep them out. 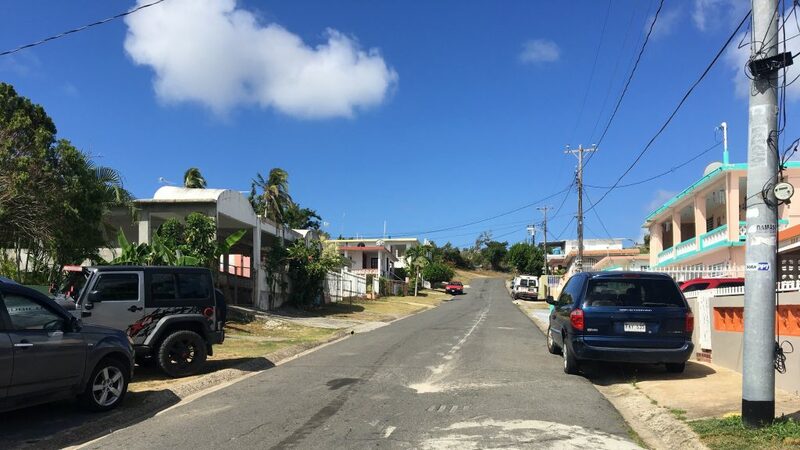 There is trash thrown down some deserted roads, there’s always somebody who doesn’t get it, but most of the people here care about their island home and don’t trash it. Every week it seems to get a little bit better as people and the municipality continue to clean up after the hurricane. The rent for our house fits in our budget, but we’ve said before that a little closer to the great beaches would be even better. We did finally buy a car, so that is mostly a non-issue now. We can bike to many beaches and now drive to the rest. 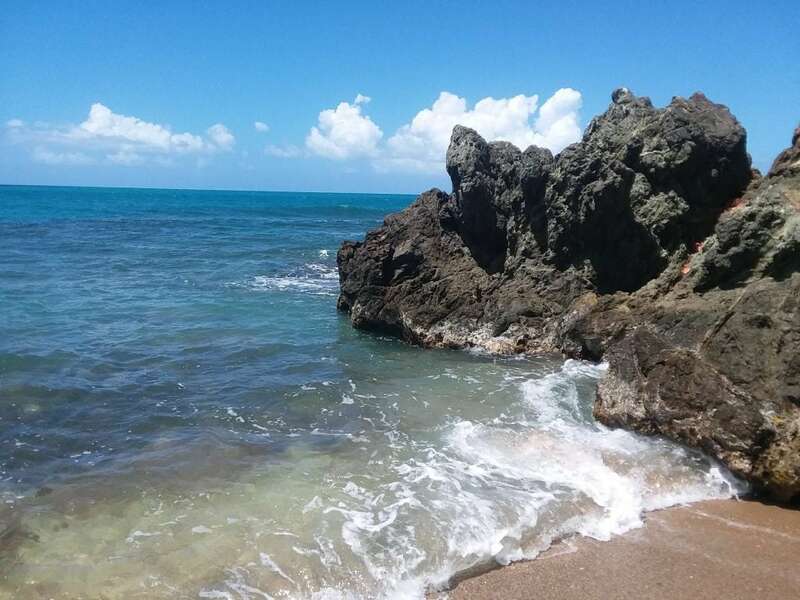 Beaches and the Sea – speaking of beaches, this is where Vieques really shines. Roatán was a step up from Utila in this area, but Vieques is in another universe. We have white sand beaches, black sand beaches (magnetic sand! ), red sand beaches, rocky outcrops, cliffs, waves, no waves, fishing, swimming, snorkeling, paddleboarding, sailboarding, even surfing. And only a portion of the beaches are open to date, as we wait for U.S. Fish and Wildlife to get off island time and clear some more of them. So we expect this to actually get even better over the coming months. IMO, the beaches here are better than what I’ve seen in California, Texas, Alabama, and Florida. They are probably better even than the Bahamas, but I’m sure you could find an argument about that if you looked for one. There is a little bit of trash on the beach, maybe comparable to what I’ve seen in Florida and other places, but nothing like Utila and still significantly better than Roatán. We are starting to make it a habit to bring a bag to the beach and do a 20 minute cleanup each time. It really has an impact and takes very little effort. There is turtle grass in the water here and there but it doesn’t take over like I’ve seen elsewhere. Spearfishing is legal here as is line fishing from the shore, piers, etc. Finally, I will say that the locals know what they have and they take advantage of it. Every Sunday afternoon they all head off to the beach, families, friends, and party groups, to close out the weekend. It’s a tradition we can get behind! People – We’ve had a great time getting to know transplants and locals alike. Once people started to see us around day after day and week after week, it got easier. We met statesiders at a couple of bars and at the craft drink mixer called Dexter’s Laboratory. That was great for us because we had something in common with them – we’re all people who pulled up stakes and put them back down on this little rock. 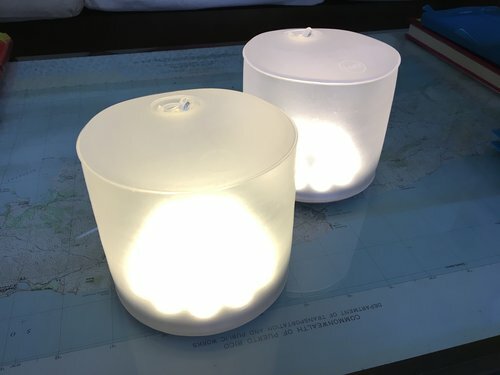 That comfort is nice, but we also are getting so much joy out of meeting real local Viequenses or other Puertorriqueños. We often struggle with the language but we knew that would be a challenge coming in. And they are so friendly to us! I’m not even sure why, but they just seem to embrace these strange statesiders who ride bikes and walk into bars carrying their little white dogs. We’ve met some really nice tourists as well. As we all do, they seem to enjoy that they know about this little hidden gem and most of the world doesn’t. There are many who come back year after year, sometimes more than once a year, and some of them even buy a house here, to rent out and/or enjoy themselves. Transportation – transportation on Vieques consists mostly of automobiles, and most of those are what we call “island beaters”. We just bought our first one, a 2003 Suzuki Vitara with a good engine, good tires, and a good AC. What more could you want? Of course we spent the first 2 1/2 months on bikes riding around this place, and it’s pretty bikeable, with a couple of key exceptions. One of the main roads along the north side of the island goes into town to the east and to the west it goes to the airport, the old navy pier, beaches and other fun sites. Unfortunately, it is also only 1 1/2 lanes wide in spots and has huge Mack trucks hauling debris to a barge at the pier for hauling away. For that reason it’s just too dangerous on our bikes. Similarly, one of the main roads across the island, and only a block from our house, is another bad one. We’re just not going to ride it on our bikes. It’s curvy, hilly, pot-holed, and in stretches, it’s also only 1 1/2 lanes wide. This is a recipe for death (or worse) on a bicycle, so we simply don’t go that way on our bikes. There are other risky roads on the island as well. Other options include taxis for $5 per person, and publicos (taxi buses that can also pick up others) for $3-4 per person. There is also a free bus service that runs 4 times a day or so. We haven’t tried it yet, but it’s probably good as well (the buses look very nice). These prices are great compared to taxis in Roatán! The bottom line is that transportation here meets all the needs and it’s only about how much you want to spend to upgrade. Environment – I should say that most of the physical and mental energy around here in the last six months has simply been on hurricane recovery. The recycling program is just getting back on it’s feet, and other environmental groups are just doing the same. There is good focus on sea turtles and egg-laying, preventing humans from ruining their nests. There is attention paid to preserve wonderful places like the Bioluminescent Bay by not swimming in it. And if we include the creatures of this island habitat, there is also the Vieques Humane Society and My Big Fat Caribbean Rescue, who together are helping to spay and neuter as many island dogs and cats as possible and get many of them to forever homes in the states. They also are trying to sterilize some of the wild horses because there are so many. I would say that Vieques is doing a really good job in this area considering they’re also still just trying to get people roofs that are not made of blue tarps. Weather – Deb just commented the other day that these have probably been the best three months of weather in her entire life. I have to agree. Every day is between 80 and 90F, with lows in the 70s at night. We wear the same thing every day, shorts and t-shirts or tank-tops, with flip flops. Every single day! We still haven’t used the air conditioner in the bedroom, there just hasn’t been a need. We have a steady breeze in the house – fingers are crossed that continues through the summer but I do expect we’ll be using the AC eventually. On rain, I originally wrote: “When it rains here, at least so far it doesn’t last too long, and it’s well appreciated.” Then last night happened and we got many inches of rain along with driving wind and thunder and lightning that came in waves and went on for hours; it was a real tropical downpour along the lines of what we saw in Utila last October. Now we have a stream running through the back yard and everything is completely soaked. Vieques gets on average 42″ of rain per year, with September (tropical storm season) having the most rain. But May is also a mini rainy season so I guess we’re in that now. The humidity we’ve experienced ranges from nicely dry to very humid and muggy and can change very rapidly as breezes shift toward and away from the African Sahara air. I suspect the summer is going to be quite hot and probably humid also with the humidity rising with the fall rains, but I expect the winter months to be spectacular again. Intangibles – the intangibles are the final factors for us to help decide whether a place is really “it”. These are more just the feelings we get from all the factors listed above. This doesn’t happen overnight but we’ve been here long enough to get a fair read on Vieques. 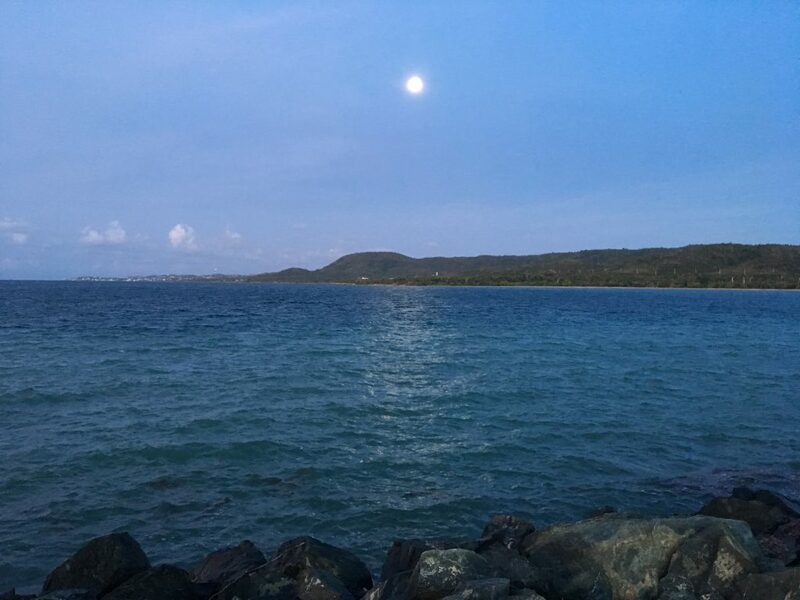 So I will say that the intangibles in Vieques are very high, maybe driven out of proportion by those fantastic beaches, but you have to go with it! The place feels very honest and solid; I guess that’s describing the people, but maybe it’s the soul of this island. Our neighbors and landlords are great, we are really happy about that. The place seems to have everything we need and most things we want. If it doesn’t exist here we can go over to the mainland of PR get it, or have Amazon send it to us! The town is pretty basic, but again has what you need. We’re learning when not to go to town (11am to noon, 3pm to 4, because everyone is trying to get something done before lunch or closing time). We have a few favorite bars, restaurants, beaches, and other fun spots. The flakey power situation continues to tease us like an annoying little brother. But it’s less of a bother as we get used to it, and also as our small solar power setup continues to cover a good part of our needs. The intangibles here are very positive, with probably only that one big exception. We’ve been saying for a while now that we are looking for a place we can’t leave. The summary on Vieques is this: with all the online research, the planning, the trials and tribulations, we feel like we nailed it! This is the place, at least for a while. The hurricane was a huge curse on Puerto Rico, but the subsequent re-routing was a blessing for us in a strange way. We learned about problems that are common to many or all islands, so when we see them again, even if in a different form, we already have come to expect them. Between this and our expectations of hurricane damage (which were certainly met), we came in with a better attitude than we might have. We get really positive vibes from the people, and are surprised at how much the local Viequenses have embraced us. The beaches are so good we sometimes have to stop and pinch ourselves. We live here, we can go to these beaches any time we want! 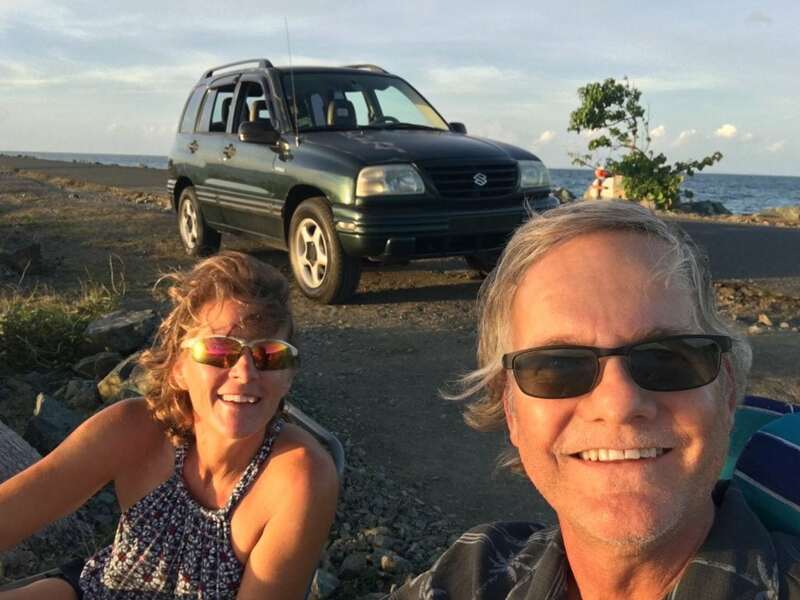 After all of our stateside roadtrips, Vieques was our third island landing point in these adventures (Ambergris Caye, Belize was really just a 3 day border run / vacation). We continue to grow comfortable living in new places with new people and new cultures. And Vieques has enough of the creature comforts of the states that we don’t really miss anything. Again, we were seasoned a bit by Roatán and especially Utila, so this place is easy to love. 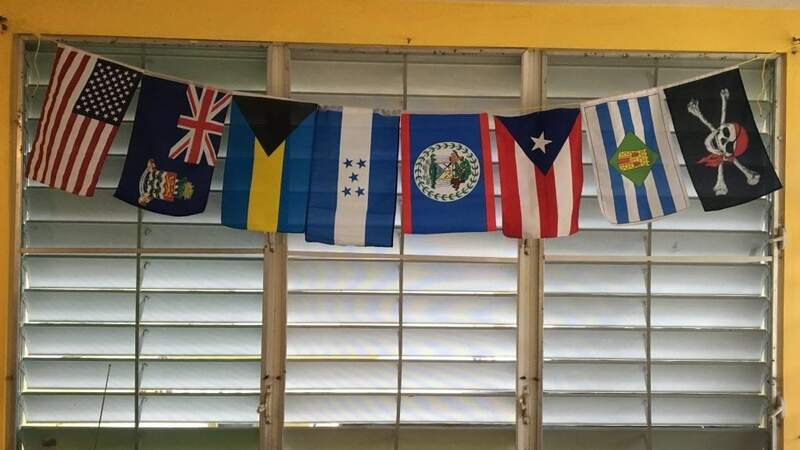 USA, Cayman Islands, Bahamas, Honduras, Belize, Puerto Rico, Vieques, Pirate! So here we are for a while; at this point we don’t even want to take the ferry to PR, we’re so done with traveling! Later on, we’ll start figuring out which other places we want to visit, but for now, we’re staying put. 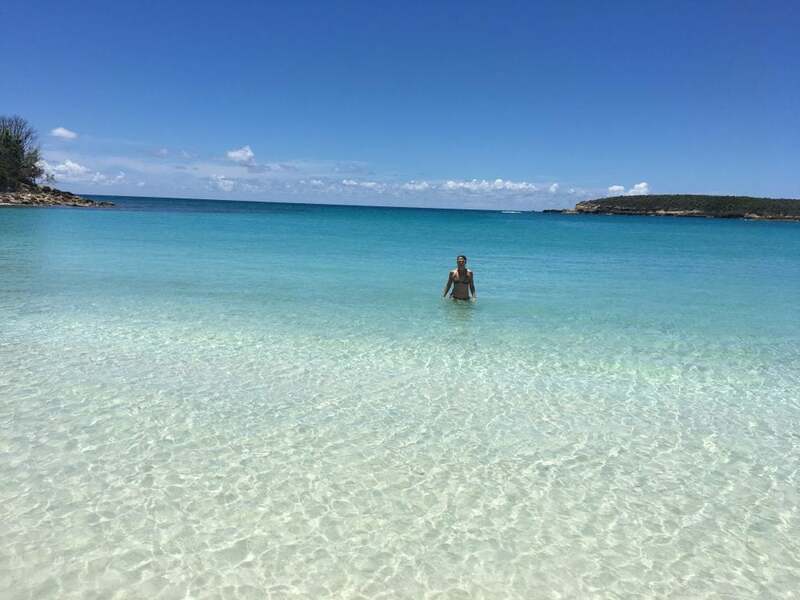 We still have lots to learn about Vieques and as we do we’ll bring it to our fellow kneedeepers, so hang in there with us! TODAY’S SPECIAL: “Magic“, by Kenny Chesney – I believe there is magic here! Cool analysis. Probably feels good to have a sense of permanence. Be careful not to let your guard down too far, on accumulating things! Sounds like you have a plan. Just don’t get so attached that you forget to come home from time to time. Love your analytical mind! Keep um comin! The locals are nice to you because you two are nice to them! Nice new ride, good choice. You’ll have to tone down the glowing description of Vieques before you singlehandedly cause a Hawaii like run on local real estate. It looks beautiful there and I’m glad you’re finding what you worked so hard to get to. “We wear the same thing every day, shorts and t-shirts or tank-tops, with flip flops.” Do you have more than one pair of shorts? Oh yes, I have at least 6 pairs of shorts and a dozen t-shirts. All are getting worn! I’m going to need to replace a pair of flip flops soon. How is the weather in the beginning of May? Thinking of visiting to celebrate my bday. Hi Lynn, you can expect mid-80s for highs, mid-70s for lows. It’s just pretty perfect IMO. Hope you decide to come. Have fun.